African Cardinal Robert Sarah has become a standard bearer for orthodoxy in an era of flux, and is attracting plenty of attention for his stance, reports The Catholic Herald. It is often said that once a new Pope has emerged on to the loggia of St Peter’s, the Cardinals’ thoughts turn almost immediately to the question of his successor. Pope Francis, although about to turn 80 at the end of this year, does not seem ready to run out of steam. Despite having part of a lung missing, he seems undiminished by a daunting schedule which he seems to relish. This, along with his obvious pleasure in his role, means that it is difficult to take quite seriously his own speculation that his papacy will be a short one. Nonetheless, nobody should be surprised that there is already much speculation about the identity of his successor. Cardinal Robert Sarah, relatively little known before the election of Pope Francis, has shown himself since as a key player in Rome. His name – pronounced Sar-AH and not like the English given name – reveals the French linguistic and cultural heritage which this son of the West African savannah imbibed at an early age from the Holy Ghost missionaries. 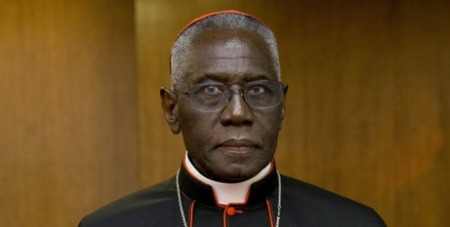 Cardinal Sarah, a second-generation Christian, is a man who combines an authentic claim to come from the ecclesiastical margins so beloved of Pope Francis with a deep grasp of the cultural and theological patrimony which the old continent disseminated along with its political and economic hegemony. We get a fascinating insight into both of these strains in his personality through his book-length interview with French author Nicholas Diat, published last year in English translation as God or Nothing. After a biographical section, where the Cardinal traces his career from the early years in a round, one-room brick hut in rural Guinea which was his family’s only possession, to his present position as head of the Vatican’s liturgy dicastery, the book offers reflections on the theological issues which today affect the Church’s internal cohesion as well as the vitality of its missionary outreach. These qualities of talent for action and fearlessness were perhaps what made John Paul II choose him as the world’s youngest bishop in 1979, aged only 34, for Guinea's capital city, Conakry, and metropolitan see of Conakry.